Convalescent plasma and fractionated immunoglobulins have been suggested as prophylactic or therapeutic interventions during an influenza pandemic. Intravenous immunoglobulin (IVIG) preparations manufactured from human plasma collected before the 2009 H1N1 influenza pandemic, and post-pandemic hyperimmune (H)-IVIG preparations were characterized with respect to hemagglutination inhibition (HI), microneutralization (MN) and neuraminidase-inhibiting (NAi) antibody titers against pandemic H1N1 (pH1N1) and seasonal H1N1 (sH1N1) viruses. The protective efficacy of the IVIG and H-IVIG preparations was evaluated in a SCID mouse challenge model. Substantial levels of HI, MN and NAi antibodies against pH1N1 (GMTs 1:45, 1:204 and 1: 727, respectively) and sH1N1 (GMTs 1:688, 1:4,946 and 1:312, respectively) were present in pre-pandemic IVIG preparations. In post-pandemic H-IVIG preparations, HI, MN and NAi antibody GMTs against pH1N1 were 1:1,280, 1:11,404 and 1:2,488 (28-, 56- and 3.4-fold enriched), respectively, compared to pre-pandemic IVIG preparations (p < 0.001). Post-pandemic H-IVIG (HI titer 1:1,280) provided complete protection from lethality of SCID mice against pH1N1 challenge (100% of mice survived for 29 days post-challenge). 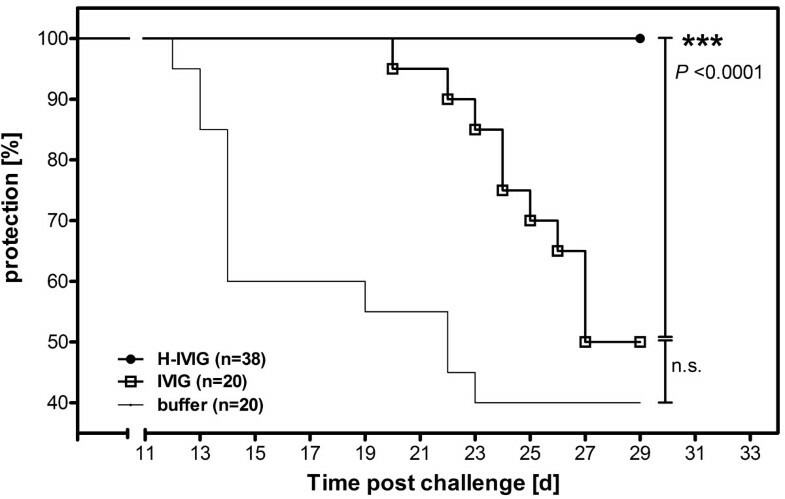 Pre-pandemic IVIG (HI titer 1:70) did not provide significant protection against pH1N1 challenge (50% of mice survived 29 days post-challenge compared to 40% survival in the buffer control group). There was a highly significant correlation between circulating in vivo HI and MN antibody titers and survival (p < 0001). The substantial enrichment of HA- and NA-specific antibodies in H-IVIG and the efficacious protection of SCID mice against challenge with pH1N1 suggests H-IVIG as a promising intervention against pandemic influenza for immunocompromised patients and other risk groups. Infectious diseases were commonly managed by passive transfer of human or animal sera prior to the development of effective vaccines and antimicrobials, and passive transfer of convalescent sera is currently still used to prevent and treat some viral and bacterial infections [1, 2]. The use of convalescent plasma and fractionated immunoglobulins [3, 4], and, more recently, monoclonal antibodies [5–8], has been suggested as a complementary strategy to prevent or treat virus infection during an influenza pandemic. Treatment of severe pH1N1 infection with convalescent plasma or H-IVIG was associated with lower viral load and reduced mortality [9, 10]. As previously reported , we investigated the feasibility of manufacturing H-IVIG as a response to the emergence of the 2009 H1N1 pandemic (pH1N1) virus. H-IVIG preparations were shown to have significantly elevated levels of pH1N1 hemagglutinating (HI) and neutralizing antibodies, as assessed by microneutralization (MN) assay, compared to standard IVIG preparations collected from donors either during or before the H1N1 pandemic . In the present study, we further characterized post-pandemic H-IVIG preparations with respect to HI and MN antibodies against both pH1N1 and a seasonal H1N1 (sH1N1) virus (A/New Caledonia/20/1999, which circulated in the Northern hemisphere and was a recommended component of the trivalent seasonal vaccine from 2000–01 to 2006–07). We also assessed the level of pre-existing cross-reactive pH1N1 immunity in the donor population by determining the HI and MN titers against pH1N1 and sH1N1 in pre-pandemic IVIG preparations. In addition, we investigated the extent to which antibodies capable of inhibiting the enzymatic activity of the sH1N1 and pH1N1 neuraminidase (NA) antigens were enriched in the post-pandemic compared to pre-pandemic preparations. We also investigated the ability of pre-pandemic IVIG and post-pandemic H-IVIG to protect highly susceptible immunodeficient SCID mice against challenge with wild-type pH1N1 virus. A total of 13 IVIG preparations (Gammagard Liquid/KIOVIG, Baxter Healthcare, Westlake Village, CA) manufactured from human plasma collected before the 2009 H1N1 influenza pandemic (manufactured January to November 2009, plasma collected >6 months prior to these dates), and two lots of post-pandemic H-IVIG preparations (manufactured July 2010)  were characterized in the present study. For IVIG production, collected plasma was pooled into two 7500-L batches, and the Cohn ethanol fractionation and downstream processes for the two H-IVIG lots were performed in full accordance with the licensed process for Gammagard Liquid/KIOVIG, a triple virus-reduced 10% IVIG preparation [12, 13]. Pre-pandemic IVIG and H-IVIG preparations were characterized with respect to HI and MN titers against pH1N1 (A/California/07/2009 reassortant NYMC X-179A), and sH1N1 (A/New Caledonia/20/1999), as previously described . Antibodies capable of inhibiting the enzymatic activity of NA (NAi antibodies) in the IVIG and H-IVIG preparations were detected using a highly sensitive enzyme-linked lectin assay (ELLA), as previously described . N1 antigens were obtained by splitting wild-type A/California/07/2009 (CDC, Atlanta, GA) and A/New Caledonia/20/1999 virus preparations by overnight incubation with 0.5% Triton X-100 at 4°C, followed by detergent removal using 20% Bio-Beads (Biorad). 6–8 week old SCID mice (strain CB17/Icr-Prkdcscid/IcrCrl; Charles River Laboratories, Germany) were intranasally infected with 30 μl containing 6×104 tissue culture infectious dose 50% (TCID50) of H1N1 strain A/California/07/2009 (9.5-fold 50% lethal (LD50) dose ) and monitored 29 days. For passive protection studies, mice were intraperitoneally injected three days prior to challenge with 200 μl of H-IVIG, IVIG or PBS control. Two independent experiments with two different lots of H-IVIG (8–10 mice per group), and two independent experiments with a pool of 5 lots of IVIG or PBS control (10 mice per group) were done. For calculation of dose-dependency, 200 μl of undiluted and 2-fold serial dilutions of H-IVIG, undiluted IVIG or phosphate-buffered saline (PBS) were used. Serum was obtained from animals before challenge, at Day 3, and at Day 32 to determine circulating in vivo antibody titers. Statistical differences between IVIG and H-IVIG antibody titers were calculated from combined data by unpaired Student t-test analysis. Differences in survival were analyzed with a Log-rank (Mantel-Cox) test. The significance of the correlation of in vitro and in vivo HI and MN titers, as determined on Day 3 and Day 32, as well as correlation of Day 3 antibody titers with survival was evaluated using a nonparametric Spearman correlation analysis (GraphPad Prism v.5.01 software). To investigate the titers of antibodies against sH1N1 and pH1N1 in pre-pandemic (n = 13) and post-pandemic IVIG (n = 2) preparations, sera were analyzed by HI, MN and NAi assays. Figure 1 shows HI, MN and NAi titers measured in pre-pandemic IVIG preparations (open bars) and post-pandemic H-IVIG preparations (hatched bars). Pre-pandemic IVIG preparations had substantial HI, MN and NAi titers against pH1N1 (grey bars) (geometric mean titer [GMT] 1:45, 1:204 and 1:727, respectively), as well as against sH1N1 (white bars) (GMT 1:688, 1:4,946, and 1:312 respectively). As expected, significantly higher HI, MN and NAi antibody titers against pH1N1 were present in the post-pandemic H-IVIG preparations compared to titers in the pre-pandemic IVIG preparations (P < 0.0001 for all serological assays). GMTs of 1:2,560 (HI), 1:11,404 (MN) and 1: 2,488 (NAi) were determined for the post-pandemic H-IVIG preparations, an increase of 28- 56- and 3.4-fold, respectively, compared to pre-pandemic IVIG preparations. In addition, higher titers of HI (1:2,560), MN (1:16,127) and NAi (1:717) antibodies against sH1N1 were also present in the post-pandemic H-IVIG preparations. Serological characterization of pre-pandemic IVIG (open bars) and post-pandemic H-IVIG (hatched bars). Antibody titers against the seasonal H1N1 strain A/New Caledonia/20/1999 (sH1N1) (white bars) and pandemic A/California/07/2009 (pH1N1) (grey bars) were determined by hemagglutination inhibition (HI), microneutralization (MN) and enzyme-linked lectin assay (ELLA, reported as NA inhibition [NAi]), respectively. Results are given as geometric mean titer (GMT) ± 95% confidence interval (CI). Statistical differences were calculated by unpaired Student t-test analysis (GraphPad Prism software). *** P < 0.0001. GMTs were calculated by testing 13 individual lots of IVIG and 2 lots of H-IVIG. The finding that substantial levels of HI and MN antibodies against pH1N1 were also present in the pre-pandemic IVIG preparations is in agreement with other vaccine and seroepidemiological studies which reported high rates of seroprotective pre-exposure pH1N1 HI and neutralizing antibody titers, likely as a result of cross-reactive antibodies induced by repeated exposure to seasonal H1N1 viruses . 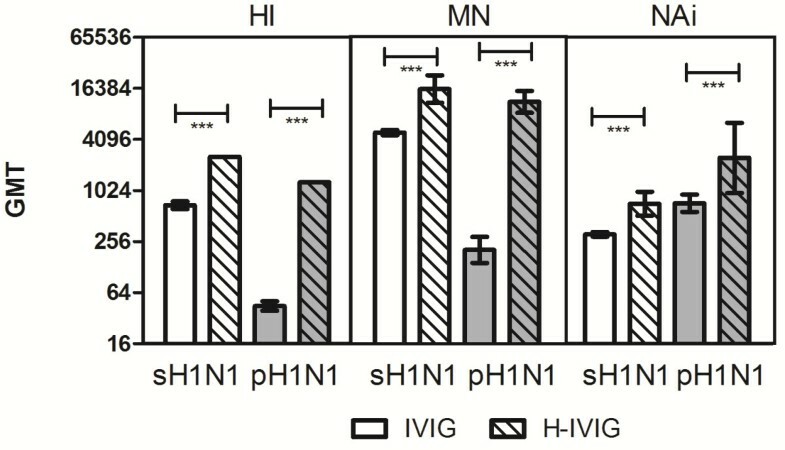 The relatively low increase in pH1N1-specific NA antibody titers in H-IVIG likely reflects the high level of antigenic similarity between seasonal and pandemic H1N1 NA proteins . To analyze the protective potential of pre-pandemic IVIG and post-pandemic H-IVIG preparations, passive transfer experiments were done in SCID mice. Administration of post-pandemic H-IVIG, prior to challenge with wild-type pH1N1, provided complete protection (100% survival) of SCID mice during the 29 days monitoring period, whereas only 50% of animals receiving pre-pandemic IVIG and 40% of animals receiving buffer survived (Figure 2). Increased survival rates (compared to animals receiving pre-pandemic IVIG) afforded by post-pandemic were highly statistically significant (Mantel-Cox Log-rank P < 0.0001) but not for pre-pandemic IVIG compared to buffer control (P = 0.15). The relatively long survival time of the mice receiving buffer only is a result of the relatively low pathogenicity of the pH1N1 virus in mice [18, 19]. Due to constraints of the challenge volume used, it was however not possible to increase the challenge dose. Protective efficacy of pre-pandemic IVIG and post-pandemic H-IVIG. To evaluate passive protection efficacy, SCID mice were intraperitoneally administered with 200 μl of pH1N1 hyperimmune IVIG (two lots, HI titer 1:1,280) or pre-pandemic IVIG (pool of five lots, HI titer 1:70) 3 days prior to challenge with 6×104 TCID50 of wild-type pH1N1 by intranasal instillation. The control group received 200 μl of PBS and survival was monitored for 29 days. Statistical differences between the IVIG group and the PBS control group, and between the IVIG group and the H-IVIG group, were calculated with a Log-rank (Mantel-Cox) test using the GraphPad Prism software. Abbreviations: d, days; n.s., not significant; IVIG, pre-pandemic intravenous immunoglobulin; H-IVIG, hyperimmune intravenous immunoglobulin. To investigate the extent to which protection against pH1N1 challenge by H-IVIG administration is dose-dependent, mice were administered with serial 2-fold dilutions of H-IVIG prior to challenge with pH1N1. Circulating in vivo HI and MN antibody titers were measured in sera taken from animals immediately prior to challenge and at the end of the experiment i.e. 29 days after virus challenge. Table 1 shows the HI and MN titers of H-IVIG preparations administered to mice, the circulating antibody titers measured at the time of challenge and 29 days after challenge, and the associated survival rates of mice challenged with pH1N1 virus. Protection was dose-dependent, and there was a highly significant correlation (nonparametric Spearman correlation r = 0.9, P <0.0001) between circulating in vivo HI and MN antibody titers measured on the day of virus challenge and survival. ain vitro titer of neat samples determined prior to i.p. injection; titers of diluted H-IVIG are calculated accordingly. bmouse serum titers 3 days after passive transfer; i.e. at the time of challenge. cmouse serum titers 32 days after passive transfer; i.e. 29 days after challenge. HI, hemagglutination inhibition; MN, microneutralization; GMT, geometric mean titer; n.a., not applicable. Note: IVIG was a pooled preparation from 5 different IVIG lots; 2 different lots of H-IVIG were used separately. Data shown are combined data from 2 independent experiments. Although these data demonstrate the potential of H-IVIG as a potential prophylactic intervention in the event of an influenza pandemic, there are several limitations to our study. In addition to showing the protective effect of H-IVIG with respect to survival of challenged animals, it would have been interesting to investigate the ability of H-IVIG to ameliorate disease symptoms (e.g. by prevention of weight loss) and to reduce viral load and cytokine levels in challenged animals. It would also have been interesting to determine whether post-pandemic H-IVIG also protects against influenza viruses of other subtypes. Several studies have reported that infection or vaccination with pH1N1 boosted broadly neutralizing HA stem antibodies in humans [20–24]. An additional limitation is that we did not investigate the potential therapeutic efficacy of H-IVIG. Several recent studies have demonstrated that post-infection administration of influenza-specific monoclonal antibodies can effectively treat mice or ferrets which were previously subjected to virus challenge [5–8]. Treatment of humans with severe pH1N1 infection with convalescent plasma or H-IVIG was also associated with lower viral load and reduced mortality [9, 10]. However, prophylactic passive administration of H-IVIG could be administered to acutely immunocompromised individuals who are at high-risk of serious complications resulting from influenza infection and who may not mount an effective response to vaccination, such as HIV patients, transplant recipients and cancer patients. In the event of a pandemic caused by a highly pathogenic influenza virus, passive immunization might also be considered for first-line health care workers and for direct contacts of infected individuals. Taken together, the data in this study demonstrating substantial enrichment of HA- and NA-specific antibodies in H-IVIG and the efficacious protection of SCID mice against challenge with pH1N1 indicate that H-IVIG could be used as a prophylactic intervention against pandemic influenza for immunocompromised patients and other risk groups. We would like to thank Claudia Stanislaw, Isabella Strini and Ernst Waeger for performing HI and MN analysis, and Nicole Hetzelt and Cherry Abraham for conducting the ELLA. All authors are employees of Baxter BioScience, manufacturer of the pandemic H1N1 hyperimmune intravenous immunoglobulin. WW, AK, MKH, JKMcV, DAB, HJE, PNB and TRK have stock options. The study was funded by Baxter BioScience. CH, WW, MKH, JKM, DAB and TRK conceived and planned the study. CH, WW; AK, RF and MRF collected the data. All authors were involved in data analysis and drafting and revision of the manuscript. All authors read and approved the final manuscript.